When the Space Age began, some five decades ago, there were many who predicted that commercial space flight would follow shortly thereafter. This included everything from passenger flights into space, orbital space stations, and even space tourism. Naturally, these hopes seem quite naive in hindsight, but recent events are making them seem feasible once more. Consider Virgin Galactic, a commercial aerospace carrier that will begin taking passengers into Low-Earth Orbit (LEO) beginning next year. And there’s Inspiration Mars, a private company that wants to send a couple on a round trip to visit the Red Planet. 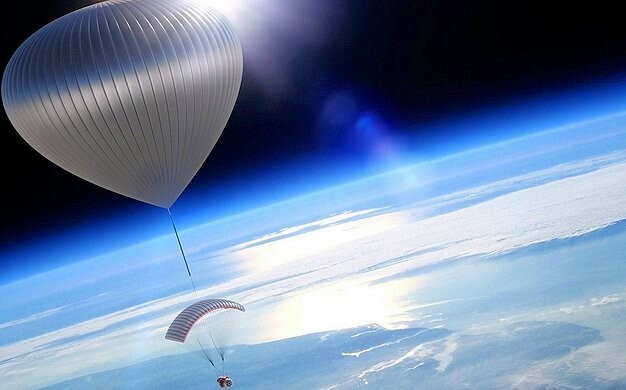 And now, there’s World View Enterprises, a company that plans to send to start sending passengers on a near-space balloon ride beginning in 2016. World View Enterprises recently obtained approval from the US Federal Aviation Administration for its proposed balloon experiences, which will cost US $75,000 a ride, and are projected to begin in 2016. 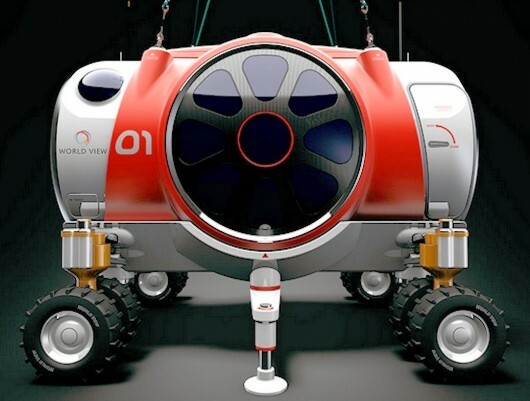 Each flight will consist of two balloon pilots and up to six passengers, which will be contained within a cylindrical capsule that comes equipped with heating and its own air-supply. 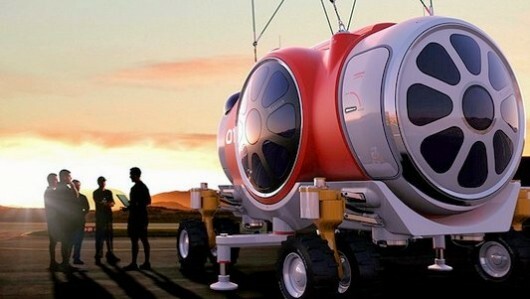 According to the company’s plan, the capsule – which measures 6 meters in length and 3 in width (approx. 20 x 10 feet) – will be deployed below a parasail (used for recovery) and tethered to a 400,000 cubic meter (14 million cubic ft) helium balloon, which will provide the lift needed to bring the capsule and its occupants to 30 km in altitude or Low-Earth Orbit. Might sound a little dangerous to some, but the FAA has determined that World View’s design meets the engineering and environmental challenges posed by Low-Earth Orbit. They stressed that the capsule be designed and tested as if it were going to have long-term exposure in space, even though it will not exceed altitudes much above 30 km, and assigned it a safety factor of 1.4 – the same as that required of manned space systems. The flight itself is projected to last about four hours, with the ascent taking 1.5-2 hours. 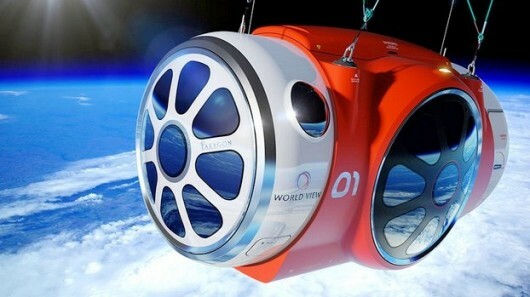 The capsule will then remain at an altitude of 30 km for about two hours, during which time the semi-space tourists will be free to move about the cabin and take in the view. Unfortunately, they will not experience weightlessness during this period. That’s comes after, when the capsule is cut off from the balloon and begins to fall towards Earth. Once it gains enough speed, the parafoil will provide sufficient lift to slow the descent and bring the passengers in for a safe, controlled landing. Before touching down, the capsule will deploy a set of skids and lands much the same way a paraglider does. 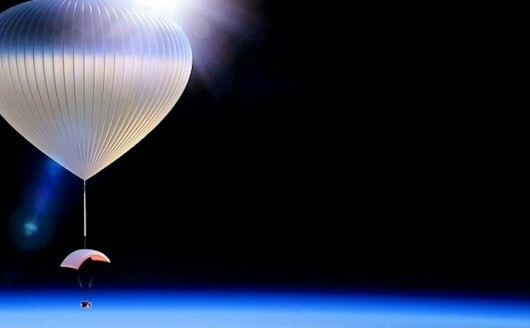 All in all, the balloon ride being suggested by World View does appear to hit many of the key points on the space tourism agenda. These include seeing black sky and the curvature of the Earth, and having a view of the planet that only astronauts are ever treated to. That may very well add up to an experience that is as good as being in space without technically getting there. The only question is, will enough passengers line up for an amazing day’s flight that costs a startling $75K? Only time will tell. One thing is fore sure though. The dream of space tourism appears to finally be upon us, though it is a few decades late in coming. Today’s dreams do tend to become tomorrow’s reality, though they sometimes take longer than expected. Looks like an adventure. The rate is quite steep though. My hubby aspires to do some space travel. After watching “Gravity” I’m leaning towards sitting this one out. I loved the view of the earth from space. It was just breathtakingly beautiful. But all the other risks? The enclosed space? Nowhere to run? Hmmm…. Yep, definitely not for the claustrophobic! Can’t help but wonder what Elon Musk is up to. Glad someone else noticed that. I do suspect it was done with one eye to the Star Wars saga. But of course, the design is a highly-efficient way of creating a window that can withstand serious pressure differences. Yes but with this method they will have to dependent on meteorological conditions like Felix Baumgartner. But I just hope they commercialize it enough so that normal people can afford doing tourism in space. Nevertheless keep that good work on that awesome blog of yours.